Are you looking for things to do in New York City? I dreamed of living in NYC ever since I was little. When I was in high school I used to study the maps and neighborhoods of New York so I would know my way around when I visited. I knew all the names of the neighborhoods, the major streets and the best things to do by the time I was 14. A few years later I made my dream a reality by moving there for college, and got to know the city as a true resident. New York will always have a special place in my heart which is why I love writing about it and sharing my best recommendations. 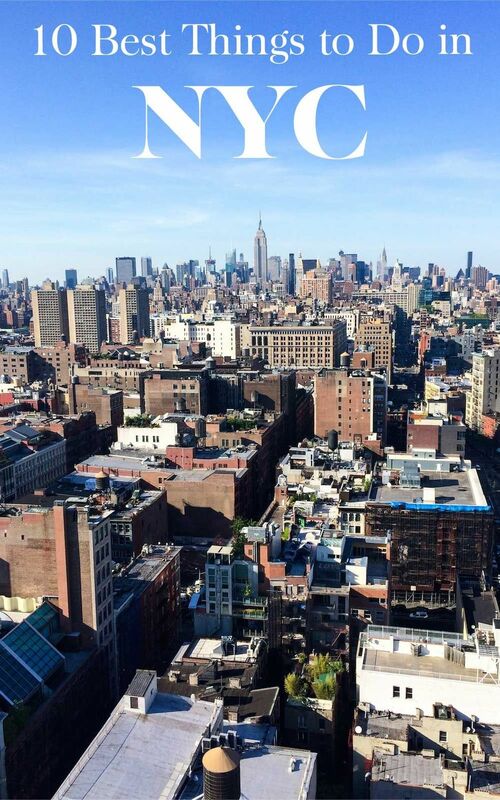 Check out my ideas for the best things to do in New York City for first-time visitors! Now, most people when they visit New York, head straight to the top of the Empire State Building. But to let you in on a little secret: the best views are actually found at Top of the Rock in Rockefeller Center! 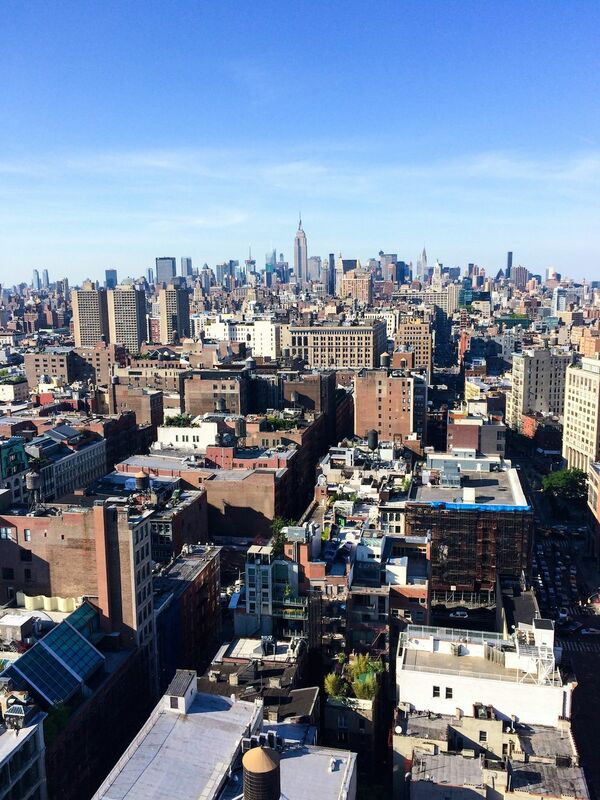 From here, you can actually see the Empire State Building standing tall against the surrounding New York skyline. In my opinion, this is where you should go! When the concrete jungle starts to wear you out, then having a picnic in Central Park is the perfect way to relax surrounded by nature while still in the heart of New York. Be sure to visit the Reservoir in Central park, then make your way down south and exit at the corner of 59th street and 5th Avenue, where you can explore a lovely square in front of the beautiful Plaza Hotel and glass box entrance to the Apple Store. The Upper East Side is a neighborhood located just east of Central Park in Manhattan. It’s probably the cleanest neighborhood in all of Manhattan and while it isn’t party central, there are a ton of cultural things to do. The Upper East Side is home to what’s known as “Museum Mile,” a stretch of 5th Avenue known for its many art museums like the famous Metropolitan Museum of Art, the Frick Collection and the Guggenheim. The hit series Gossip Girl takes place on the UES and one of the city’s best French restaurants can be found there: L’Absinthe. Eat a burger at one of New York’s most famous burger joints: Shake Shack before walking around Madison Square Park, and then admiring the early 20th century architecture of the Flatiron Building. In the heart of Greenwich Village is Washington Square Park, a must visit for Bob Dylan and 60s beatnik culture fans. The central fountain is where the opening credits of the hit TV show Friends was filmed in the 90s. The beautiful stone arch reminiscent of L’arc de Triomphe in Paris marks the start of 5th Avenue. This is one of my absolute favorite things to do in New York City! The Highline is an elevated outdoor walkway that was landscaped over former railroad tracks. It was completely landscaped and finished by a group of mega NYC donors so it could be a welcoming public space for everyone. It runs along the west side of Chelsea from Little West 12th Street all the way through West 34th Street. There are seasonal public art exhibits, too so watch out for sculptures and wall murals! I’d recommend starting your day in the Meatpacking District, where cobblestone streets give this area a European charm, and working your way north from the southern entrance. You can get on or off at various points every few blocks in West Chelsea so don’t worry about being trapped the whole way through! 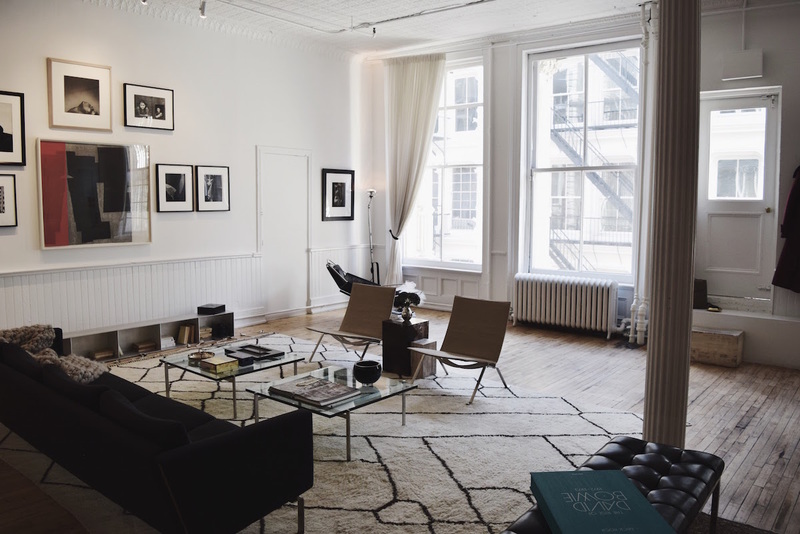 If you’re curious to step inside a real Soho loft, then head to The Apartment by The Line, where you can see a beautifully decorated apartment in which everything is for sale! After, be sure to explore the lovely neighborhood of Soho – where the cast iron lofts are reminiscent of old, industrial New York. MoMA, as it’s called by New Yorkers, is easily one of the best modern art museums in the world. Seriously, this place has billions of dollars of artwork inside, and you’ll get to see priceless artworks such as Andy Warhol, Gold Marilyn Monroe (1962), Henri Matisse, Dance (I) (1909), Pablo Picasso, Les Demoiselles d’Avignon (1907), and Vincent van Gogh, The Starry Night (1889). Unfortunately this place is always busy no matter what day of the week you go, but I’d recommend the morning to avoid the crowds. Other top art museums in NYC include the Guggenheim Museum, the Whitney Museum, the New Museum, and the Frick Collection. The Brooklyn Bridge is nearly as iconic as the Empire State Building itself. Upon reaching Brooklyn, discover the industrial neighborhood of Dumbo, and head to the corner of Washington Street and Water Street for the perfect photo op. If you’re into the hipster vibe, then definitely head to Williamsburg where everything counter-culture and non-mainstream is celebrated! Start the day with a fresh cup of specialty coffee from Toby’s Estate. Next, you should eat at Marlow & Sons for some hearty farm to table dining. Shop at Beacon’s Closet for unique, gently used and vintage clothing. End your day at the buzzy rooftop bar The Ides at the Wythe Hotel for sweeping views of the city that will take your breath away! If you visit New York in the early winter: Head to Rockefeller Center to check out the enormous and beautiful Christmas Tree, as well as ice skating rink! You’ll notice I left out tourist hotspots like Times Square and the Statue of Liberty. You’re welcome to visit these places, but to get a more local feel for New York, these are the things I recommend. Have you ticked any of these things to do off your New York bucket list?